The 7007-PWN-08-3 is no longer available. Our SP-03-N4 may be a suitable replacement. 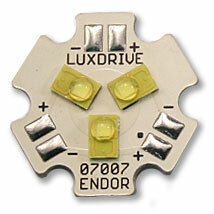 The Endor 7007-PWN-08-3 Rebel Star light module by LEDDynamics™ features pre-mounted Luxeon® Rebel neutral white LEDs that can generate 240 lumens at 350mA and 435 lumens at 700mA. The star base is footprint compatible with standard Luxeon Star LEDs and features electrical isolation between the Rebel LED and the base with solder pads that can be soldered to using standard hand soldering tools. You can find technical information for this discontinued item in the documentation below.